When most people come across a flower frog they don’t have a clue to what it is, or what you would possibly do with it. 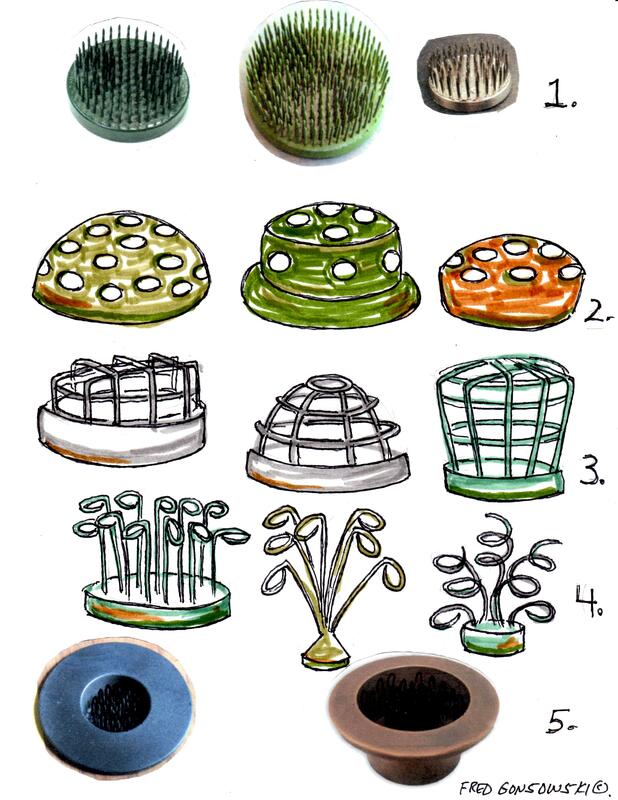 Most flower arranging frogs look like some kind of metal pin cushion with perfectly aligned rows of nails sticking straight up out of it (see illustrations 1). Other frogs that are made of glass, metal or ceramic, might be the size of half an orange or grape fruit with many equal sized holed going straight down into it like illustrations 2. Still other frogs might resemble the lid of a canning jar with a kind of wide mesh (wire) screen stretched over it (illustrations 3). There are also frogs that look like a weighted base with wires raising up and looping as they project out of it (illustrations 4). My sister bought a frog with a weighted base that holds water; that kind of frog can be used as is, or submerged into a larger receptacle (illustrations 5). When picking a vase / container to place your frog in, don’t pick one that is too tall. Try to find something that hides the frog and maybe has 3 or 4 inches of extra side height to contain your flowers. You can go taller / higher, but first try something like I am suggesting. After placing your frog in the container fill it with water, along with a cap or two of bleach to keep the water clear. If you are using a clear glass vase, pour / place some clear glass marbles or fancy small stones, or even sea shells, etc in the bottom of the container to hide the frog. I have many times taken leaves from hostas, maple or oak trees, and even the sward shaped leaves of irises, etc and cut them to size and inserted them inside the clear glass vase to hide the frog. The bleach in the water keeps the water clear and the foliage from decaying too fast. Arranging flowers using a frog is easy and gives you a professional looking presentation. There are basically two ways of inserting your flowers into a frog; you can go from the outside edge of your frog working toward the center, or you can start at the exact center (which will be the highest / tallest point of your arrangement) and you can cut and arrange flowers working toward the outside edge. After placing all your stems in the frog, insert extra foliage and flowers in the space around the frog to the containers lip for extra fullness if needed. When working with a pin cushion styled flower arranging frog, you can either insert stems between spikes, or impale stems on the spikes. Flower frogs come in an assortment of sizes and shapes. Mine are all metal pin cushion styled, like illustrations 1. I have a small and medium-sized square, as well as a small, medium and large round shaped frog, so I can insert one of them into any kind of container. Flower Arranging Frogs can be purchased at better garden centers, florist stores, botanical garden gift shops, through gardening catalogs, and on-line. Most frogs sell from $7.. to about $20. each, but I have seen antique Frogs at Trade Secrets Ct, a rare plant and antique garden ornament sale in Sharon, Connecticut, that I attend yearly for much higher prices; some going from $125. to $200. each. Antique frogs are quite fancy. I have seen fish shapes, crabs and lobsters, star fish, turtles and of course frogs to name a few. Finally, check the water level in your arrangement daily, stick your finger into it to see how much water the flowers have drunk; some flowers are quite thirsty and go through water quickly. When it comes to all things flower arranging, along with using a frog, the more you do it the better you will get. I say, start experimenting and have fun with your flower frog, it will encourage you to make many more flower arrangements. Happy Arranging! This entry was posted in How-to, The Autumn(Fall) Garden, The Spring Garden, The Summer Garden. Bookmark the permalink. Nice information here Fred. For the past few months I’ve been taking some floral design workshops and I recently acquired two 2.5-inch and 1 3-inch holders like your illustration 1. I have several glass ones like type 2 that I think belonged to my grandmother (they came to me through an aunt). The kind your sister bought looks very handy.